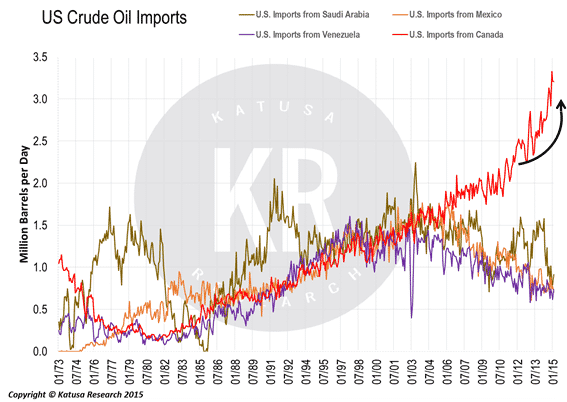 As much as Canada is the land of ‘eh’s’, igloos, and apologies, our US neighbours to the South (or neighbors, as they say in America) are often unaware that our oil is the largest share of their crude imports—and it just keeps growing. Most of that growth can be attributed to the record amount of bitumen production coming from the Alberta oil sands. Bitumen is ultra-heavy oil from the sands in the Athabasca Basin in Eastern Alberta. It is classified as heavy oil because of its low API gravity (under 10), which makes it much heavier than water with a viscosity similar to peanut butter. Bitumen is also referred to as “dirty,” because of a high sulfur content of over 1%. It is an unstoppable force that has rallied through the best and worst oil markets. 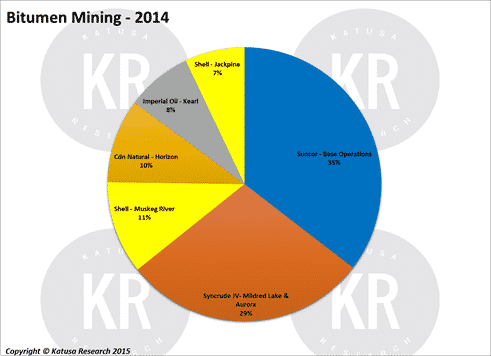 Mining in the oil sands continues to make up the majority of oil sands production, thanks in large part to the Base Operations of Suncor (SU), which produces half a million barrels per day of bitumen. Warren Buffett is a fan of Suncor, and is a large shareholder. In mining operations, the sands are physically removed and trucked to a facility where they are crushed and turned into slurry. Water and sand is extracted from the slurry and the water is recycled; the sand and other solids are left in a tailings pond. In the mining process it takes 3 barrels of water to extract one barrel of oil. Once the bitumen is extracted, diluent is added for transportation. extract one barrel of oil. Once the bitumen is extracted, diluent is added for transportation. In Situ bitumen extraction is very similar to conventional oil extraction. The process commonly uses steam assisted gravity drainage (SAGD) which involves drilling two horizontal well pairs, with one on top of the other in each pair. The top well is the steam injector and the bottom well catches and pumps the bitumen to the surface. Natural gas is used to heat water to create steam which is pumped and heats the bituminous sands. During the in situ process, operators use 10 times less water to extract a barrel of oil as compared to mining operations. To In Situ or Not to In Situ? 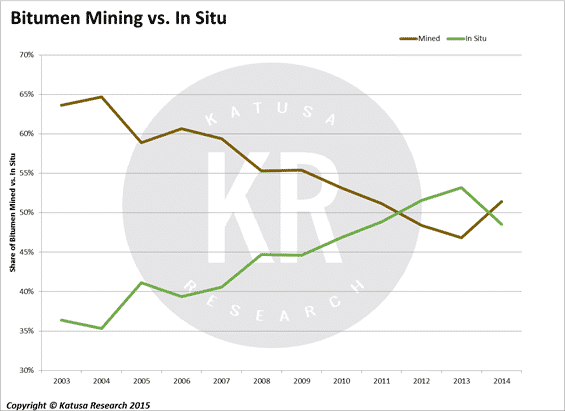 The developments and innovation of In Situ mining have caused the bitumen extraction method to take off, largely supplanting mining operations. Record levels of cheap natural gas and the newfound abundance of ultra-light oil from shale formations in the Eagle Ford has reduced the cost to develop and transport bitumen. At the same time, bitumen producers are constantly looking for ways to reduce input costs and minimize its effect on the environment. 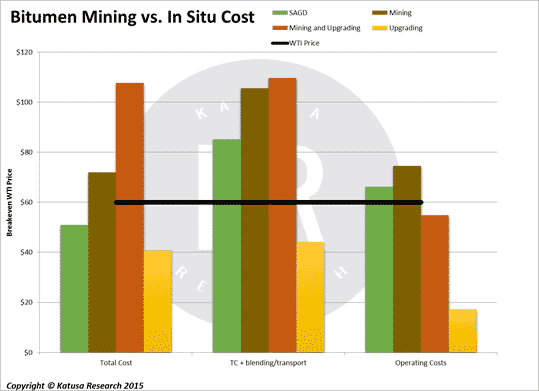 In Situ extraction is the cheapest method of the bunch with total breakeven costs just under $85 per barrel for new projects and breakeven operating costs as low as $65 for existing projects. With the annual average WTI oil price remaining under $100 per barrel, it is no wonder most new bitumen projects are in situ. 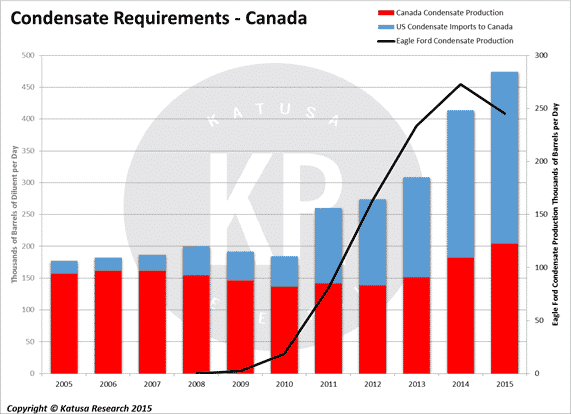 With the rising in situ oil sands production and record exports to the US, Canadian crude was running out of one source that was pertinent to their bitumen production: condensates. Condensates are mixed with heavier oils for lower viscosity and easier transportation and refining. When bitumen is transported by pipeline it requires a mix of 70% bitumen/30% condensate-diluent; when transported by rail the bitumen must be diluted by 30% less than on pipeline. 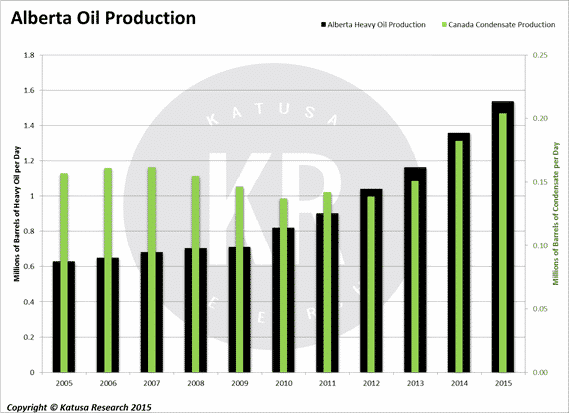 As oil sands production rose in Alberta, domestic condensate production subsided into 2010. This left oil sands producers frantically looking for condensates and they came from the Eagle Ford. New Western Canadian Sedimentary Basin (WCSB) liquid-rich deposits in the Duvernay and Montney were tapped by the likes of Trilogy Energy (TET.TO), Shell (RDS-B), Encana (ECA), and ARC Resources (ARX.TO). But they are not enough. I saw this trend of Canadian condensate needs coming, back in 2013, and took a large position in an over-looked junior, Blackbird Energy (BBI.VN), run by Garth Braun. 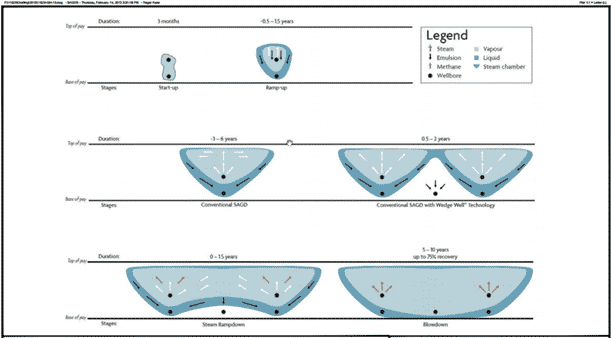 It has a very large land position in the Montney which provides an alternative to the American condensates. I like Garth Braun, and I like the Montney. My subscribers, my fund and I personally made a spectacular return on the Private Placement in 2014. I believe the Montney has a bright future, and for the high risk oil speculators in the audience, Blackbird Energy (BBI.VN) is as good of a punt as any in the Montney. However, Eagle Ford condensates still make up most of the shortfall. Enbridge’s (ENB) Southern Lights pipeline carries 180,000 barrels per day of condensate up to the oil sands operations from the Midwest, and the company also uses trains to get condensate to Alberta. It has partnered with Keyera (KEY.TO) and Pembina Pipelines (PBA) to transport and store condensate within a network of facilities near the Athabasca Basin. Since global oil prices have stayed relatively low into 2015, we are seeing minor condensate production rolling over in the Eagle Ford. As a result, the diluent will increase in cost—which is awful news for the heavy oil producers selling into the US. 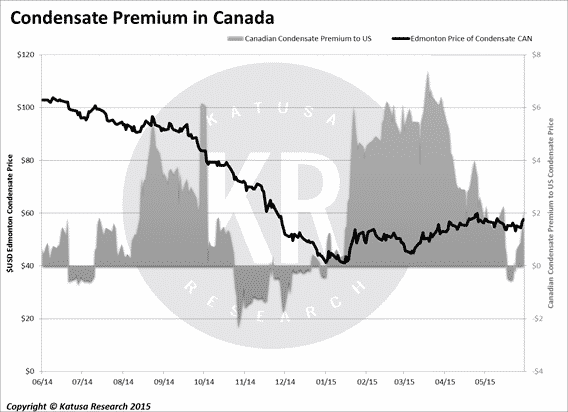 As bitumen production continues to grow in the midst of low oil prices, and Eagle Ford supplies continue to fall, oil sands producers are beginning to worry about the higher costs associated with more expensive diluent. In the oil sands game, the only way to survive over the long term in to adapt through innovation. The first piece of innovation comes from Cenovus Energy (CVE) with its patented Wedge Well TM technology that brings the concept of down spacing from US shale formations to the oil sands. Down spacing is a common efficiency method used by US shale producers to reduce the risk of drilling underperforming wells. US producers will space wells closer together to extract more oil from the same land position. Cenovus has tested its Wedge Well TM technology with 114 wells at its Foster Creek and Christina Lake operations. In a normal in situ operation, two well pairs will be drilled 100 meters apart. As steam condenses into water and flows up the production well, two separate wedges are created. Eventually, the process continues and the space between those wedges closes. The Wedge Well TM technology simply drills another producer well in between the two pair wells to collect the heated bitumen in the wedge that was formed. The process results in 10-15% increased bitumen recovery and reduces energy inputs by reducing the equivalent steam energy needed to extract an equivalent amount of oil. The steam-to-oil ratio (or SOR) drops from over 3x to around 2x. The second piece of innovation comes from Cenovus and MEG Energy (MEG.TO). 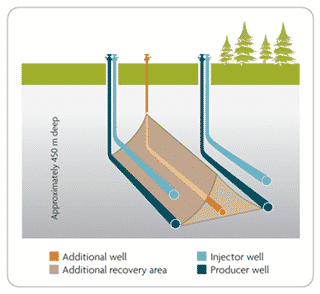 In the regular SAGD process, non-condensable gas, methane, is injected in the well after 6-8 years to keep wells pressurized during the ramp down of in situ Pressure within the well pairs keeps oil production steady; as the steam condenses, the pressure is reduced and the well performance drops. By injecting un-condensable methane, the pressure rises between the well pairs and oil pumps up at a higher rate. MEG Energy and Cenovus’ enhanced modified steam & gas push (eMSAGP) injects trace amounts of methane earlier in the SAGD process—within 3-6 years—and drills infill wells between well pairs to increase well pressure and enhance oil recovery. MEG Energy’s eMSAGP test wells at Christina Lake have reduced steam requirements by 25% and have shown SOR to drop from 2.5x to as low as 1.1x. Innovation number 3 is a new take on the SAGD process. 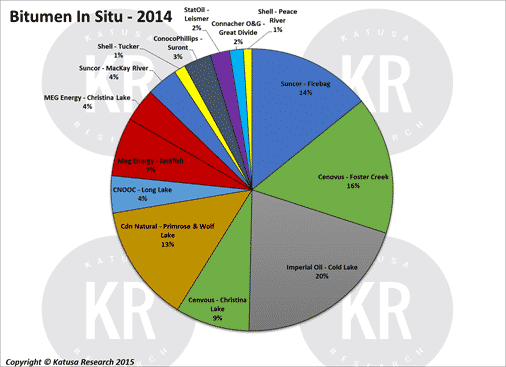 Imperial Oil (IMO), Suncor (SU), and Cenovus are all on the cusp of the implementation of a new SAGD system. Instead of using steam to heat bitumen to over 176 degrees Fahrenheit, these companies are using heated diluent in the form of butane and/or propane that does not require such intense heat to flow bitumen. The diluent mixes with the bitumen to reduce its viscosity which increases the flow of bitumen back up the producer well. The process reduces the energy needed to pump bitumen back up to the surface and has the combined effect of reducing the bitumen’s thickness as it surfaces; making it easier to transport. This method has reduced greenhouse gas emissions by 25-30% and is a big step forward in demonstrating that oil sands extraction can limit negative environmental effects. The final and most impressive innovation in the oil sands sector came in 2012, when Suncor’s Enhanced Solvent Extraction Incorporating Electromagnetic Heating (ESEIEH or “Easy”) reached the proof of concept testing. The ESEIEH project is a partnership between Suncor, Laricina Energy, Nexen, Harris Corporation (HRS), and Alberta Innovates. In the well pairs, Harris Corporation’s patent-pending antenna technology will travel down the upper well and heat the bituminous formation with radio waves. Diluent will travel down the same well and reduce the viscosity of the heated bitumen so that it can be collected and pumped up the producer well. This technology is now beginning its testing phase at Suncor’s Dover facilities in the Athabasca Basin. The ESEIEH technology is a game changer for Suncor and the oil sands as a whole. It will allow both mining and in situ operations to remove the use of water and steam from their operations. That means oil sands companies would no longer burn natural gas directly to heat water, they would no longer need to use water from Alberta’s rivers and lakes, and they would reduce costs by not having to truck, dispose of, and recycle water. Oil sands operations are truly long term projects that are very difficult to turn on and off. It often takes years to get a well producing and will take several years to restart a well if it’s shut in. These lumbering dinosaurs of North American oil production know they will need to innovate to compete in a sub-$100 and/or sub-$80 oil environment, in order to prevent their extinction. Additionally, with mounting opposition to the emissions of oil sands projects, producers must innovate to reduce their carbon footprint. Shale players in the US have been forced to speed up the pace of innovation as oil prices fall in the short term. Likewise, Canadian oil sands producers must also constantly innovate, in order to stay competitive with other forms of energy, including coal, shale oil, gas, nuclear, and renewable energy. And they have.